Windy from north, intermittent slight snow mist, 34 deg. F. Heavy rain last night. Rain gauge not measured. Drove DX-55 tractor to arena area. Slippery, used four-wheel drive. Walk to grove revealed no track. Camera tucked under zipped field coat. Hawk sighted, soaring low from north to south along pasture. No definite typing. Voice resembles a high-pitched shrill pweeeeeee; diminishing (see Peterson, A Field Guide to Western Birds, p. 68, under Broad-Winged Hawk (Buteo platypterus) [2nd ed., 1969]). Tailbanding verification is ambiguous. Deer track found on north side of The Grove, near corn site. No corn set out for five days. One deer track. Mature. Headed southwest. Scouting to creek area revealed no deer track. 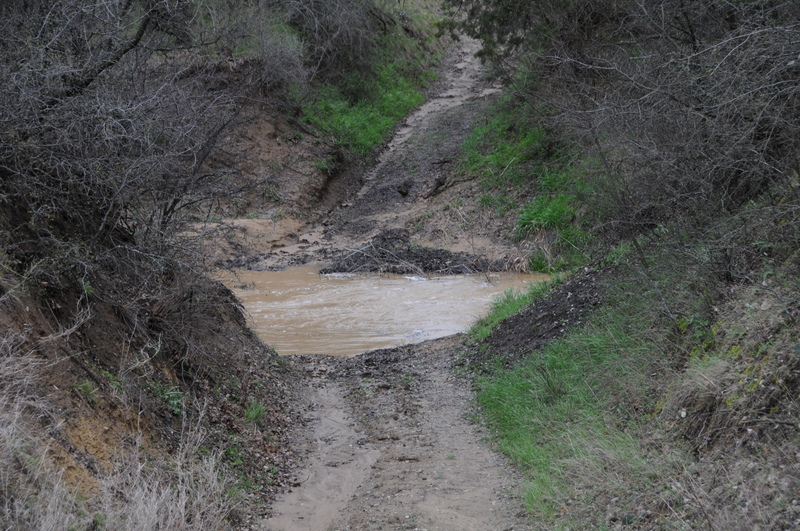 Creek running high at approx. three (3) feet above normal. 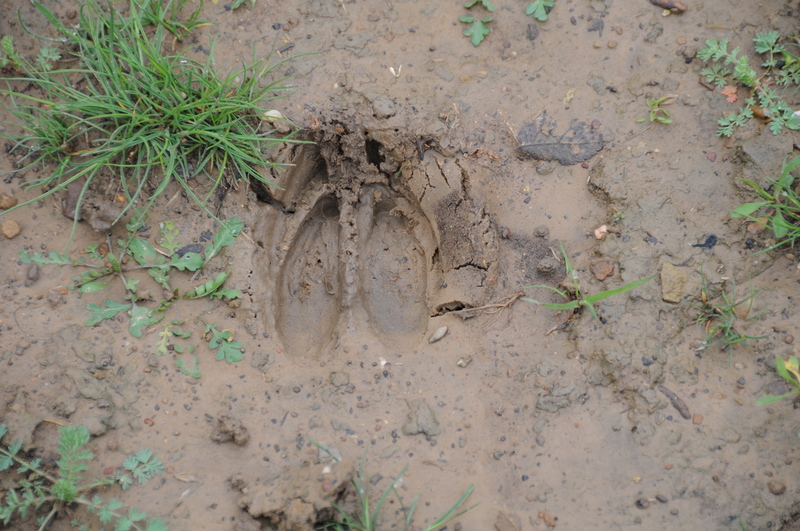 Upon returning to house, deer track discovered along Poprock Hill Pasture, near the Blue place pond. This indicates the one deer is still browsing between Blue’s pond, our pasture and the grove area. No track emanates from Hall place to the southeast, as it used to. Note: talk to Blue and verify continued support of brush growth around his pond. One or two deer, not fifteen. Returned to house at 11:15 a.m. 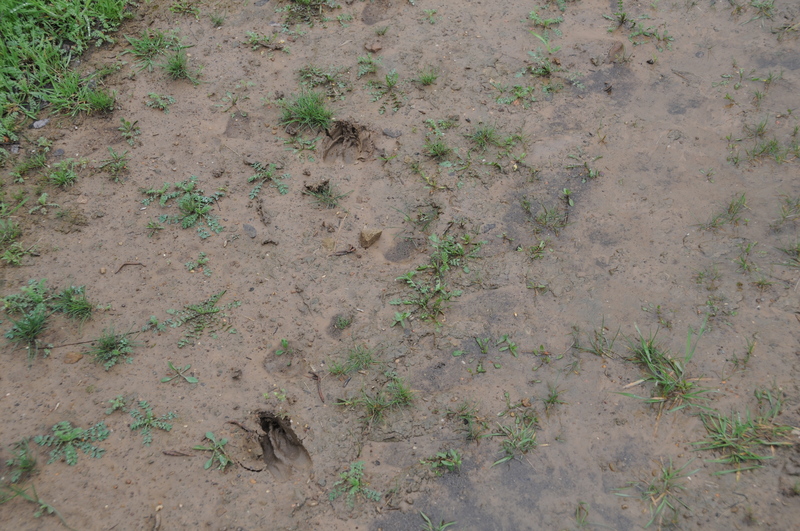 Such strong deep standing tracks that deer made in the muddy soil. I hope the others return sooon. I do, too. I read where I can give them a supplement with corn. I go back and forth on how much to put out. Jack: with all your new settlers, did you also acquire lots of dogs? I’ve about decided the reason we seldom see the deer (and have never seen the elk) that we share this land with is because just about every neighbor in the area has a few dogs that not only run loose but roam the entire slope…so wondering if that could be part of your deer problem? Martie: Yes, that is part of the problem. The neighbors to the southeast brought in two dogs that they let loose a lot of the time. And, to the north of us a neighbor has a German shepherd (love the breed) that is always outside. These three good dogs contribute to startling the flight animal–deer. These three dogs do contribute to frightening all sorts of wildlife. We have two dogs, one a lab and Australian shepherd mix, but we keep them inside and when we take them outside, we have them on leash. The neighbors to the southeast that brought in the two dogs are new residents and they have cleared the brush off of their six acres for horses, aesthetics, and just plain clearing for progress sake (go figure). Loose dogs are a part of losing deer on our place, migrating and loafing. I am making plans to replenish brush cover. I will talk to my neighbors to the west (from whence came the bullets) and coordinate their pastures with mine on this problem. It probably won’t work, they’ll pussyfoot and plead “don’t have time”, but I have a plan. You can’t beat a man with a plan. At least some of the time, he’ll win. What did Lodgeskins say in Little Big Man? Sometimes the magic works and sometimes it doesn’t. I’ll try a little magic, I guess. Thanks for bringing up the issue. You and I and our families are dog lovers, but we steward them. A man with a plan…I love it. Being good stewards is correct. I wish I had a nickel for everytime I’ve been told “it’s not natural” for my dogs to be in a fenced yard (think: big corral). PS I’ve also had the unfortunate experience of seeing my neighbor’s dog with a face full of porcupine quills…something I don’t think is so very natural. Go figure. “Not natural,” heard it a hundred times, too. No, not natural, the porcupine quills. My good friend Jimmy, out in Utah, great dog lover, keeps his animals within a fence. They are near Kanab, Utah. I read carefully your posts about dogs to pick up some tips. I liked the idea that you sent your latest addition to a trainer. Good master. Good dog. Thanks, Martie. Martie: That’s one of the major reasons Jimmy Henley (classmate since primary school) and his wife, Caralee Woods, moved to Kanab. They are very active in taking in dogs and cats and giving them the best surroundings possible. Caralee occasionally posts here. She is the one that recommended a book about legal protection for animals that, I think, you purchased from Amazon.com. Their website for their strawbale home is on the blogroll. They have an interesting life out there. I helped them move out to Kanab, driving a trailer and pickup for Jimmy. He was undergrad dean at TCU. She was a book rep for Harper&Row. Now, they are both retired. I have a stack of reviews and the New Yorkers beside my bed, at least 1.5 feet high. You gotta have a book beside that bed or in the hand.